Here's is our family's favorite Easter game.. The Bunny Tail Tale! It is a story of a Bunny trying to find his tail that is combined with a gift exchange! If you have never played a "Right- Left" game you are definitely going to love this Easter game. As the story is read to the group, everytime the word "Right" or "Left" is mentioned in the story, you pass your gift in that direction! It is fun for all age groups. The "gifts" don't have to be anything large, different Easter candies will work.. the fun in this Easter party idea is the movement of the gifts! One happy customer, used this to determine the order of the group to line up for their Easter egg hunt! We love to play games in our family for any holiday celebration. It is such a fun way to keep everyone together and our kids are now carrying on this tradition in their own families... so The Bunny Tail Tale will be making an appearance with our daughter's Easter celebration this year! "I have organized many events for families and children over the years. I absolutely LOVE the Bunny Tale Easter Right Left game. It is a personal favorite of mine. "Not only is it adorable for children, but the RIGHT-LEFT chaos makes the game fun for the whole family and a great addition to any Easter celebration. It's light, fluffy, creative and FUN! Use it to distribute some fun Easter prizes or use it to select the order everyone gets to head out for your Easter egg hunt. It's definitely a game the whole family can participate in and enjoy." YOU CAN ORDER THIS FUN FILLED PRINTABLE EASTER BUNNY TAIL GAME HERE! Once you download it, it is yours to keep and print forever! Here is another super fun twist on a traditional Easter Egg Scavenger Hunt. In this printable pack are 5 pages of clues to find hidden eggs around your house. So don't worry if your home doesn't have all the spots, there are plenty to choose from in this great game pack! The clues are in the form of Easter word searches, crossword puzzles, rhymes and more! The kids have to "unlock" the clues for each spot and then head over to that area of the house to find the egg. There is a page of printable colored eggs you can cut out in use in lieu of plastic eggs. Perfect for a rainy Easter day.. the hunt can easily be held indoors! We love that the clues are so creative and makes the hunt last longer! Again, download once and they are yours forever! 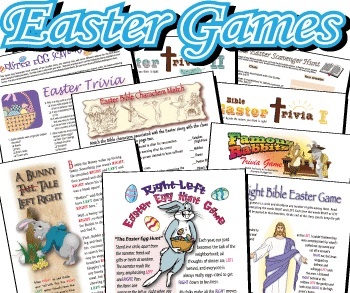 Who doesn't love a good Trivia game.. well here are two printable Easter Trivia games that are really well done. The first one has a Biblical themed game and the second one is a seasonal Easter Bunny themed trivia quiz. The Bible trivia is perfect for a Sunday school class Easter party too with questions like "For what did the soldiers cast lots?" This Easter game is a wonderful way to learn or reinforce the religious story of Easter. The Easter trivia has questions like "Which part of the chocolate bunny do most people eat first?" Lots of laughs as everyone compares answers or play on teams and get the competition going!! If you just can't decide between all these fun games, consider ordering the entire Easter Game Pack at a big discount! These are all included but a really cute "Famous Rabbit" quiz, Easter crosswords, additional Bible quiz pages and more! Simply CLICK HERE to order the Easter Printables: Easter Games bargain pack Since you download once and you can keep all the games, this is a real savings with so many games to use this year for Easters to come! Visit our EASTER FUN section.. ideas for festive Easter desserts, Easter crafts for kids, Easter decorating ideas and more!